It's very easy. Download one of our animated wallpaper files to your computer. After the download finishes, double click on the file. You will see the animated wallpaper on your desktop immediately. 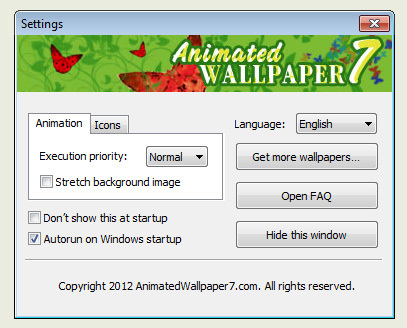 The first time you run animated wallpaper, you will see its settings dialog in the center of screen. Check the "Auto run on Windows startup" option. 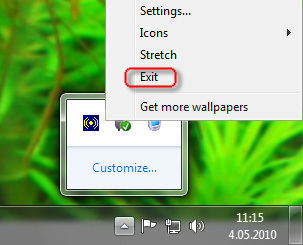 Click the animated wallpaper icon in the tray, as shown in the screenshot below. In the menu, click the "Configuration..." option. 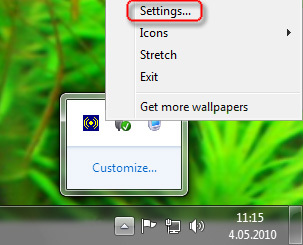 Click the animated wallpaper icon in the tray, as shown in the screenshot below. In the menu, click the "Exit..." option. What is the difference between demo and full versions? The demo version works for 3 minutes only. The full version is free of all limitations. You can have it on your desktop as long as you want.